In the Functions of the Heart unit is an extension of Topic 6.2 The Blood System. However, the emphasis will be on the function and structure of the heart. We will learn how electrical impulses sent from the brain regulate the heart beat and how this can measured. We will also look at factors that can affect the function of the heart. This unit will last 4 school days. Internal and external factors influence heart function. List variables that lead to the development of the stethoscope. State the function of the stethoscope. D.4 U 1 ​Structure of cardiac muscle cells allows propagation of stimuli through the heart wall. Compare cardiac muscle tissue to skeletal muscle tissue. Contrast cardiac muscle tissue to skeletal muscle tissue. Describe how the Y-shape, intercalated discs and gap junctions of cardiac muscle cells allow for propagation of the stimulus to contract. Cardiac muscle tissue is unique to heart. It is striated in appearance and contractile proteins actin and myosin is similar to that of skeletal muscles. Cardiac muscles are shorter and wider than skeletal and have only one nucleus where skeletal has many. Contraction of cardiac is not voluntary. Cells are Y-shaped and join end to end in a network of interconnections. When two cell ends meet they are connected by a specialized junction called an intercalated disc (only in cardiac cells). The disc consist of a double membrane containing gap junctions that provide channels of connected cytoplasm between the cells. This allows rapid movement of ions and low electrical resistance. The Y shape and being electrically connected by gap junctions allows a wave of depolarization to pass easily from one cell to a network of other cells and a synchronization of contraction. So heart contracts as one large cell. ​Lots of mitochondria found in cells to supply energy. D.4 U 2 ​Signals from the sinoatrial node that cause contraction cannot pass directly from atria to ventricles. 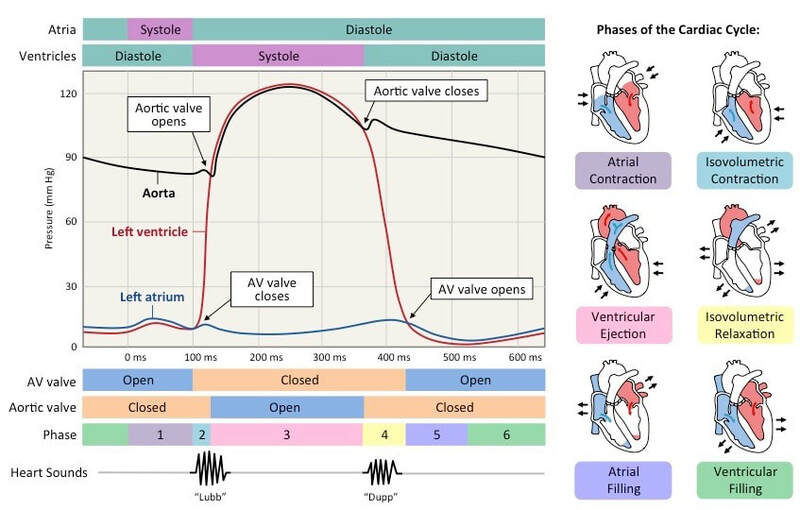 Explain the events of the cardiac cycle, including atrial and ventricular systole and diastole and the movement of the signal to contract through the heart. Cardiac cycles is a repeating sequence of actions in the heart that result in pumping of blood to lungs and body. Cycle starts with beginning of one heartbeat to the beginning of next. Contraction of heart’s chambers is systole and relaxation is diastole. D.4 U 3 ​There is a delay between the arrival and passing on of a stimulus at the atrioventricular node. The contractions of the atria and ventricles must be staggered so blood flows in the correct direction. When action potential is delayed about 0.12 seconds. Action potential starts at SA node and travels to the AV node. The fibers in the AV node take longer to become excited. ​Reasons why: They have smaller diameter and don’t conduct as quickly, reduced number of Na+ channels in membranes, fewer gap junctions between cells, more non-conductive connective tissue in node. D.4 U 4 This delay allows time for atrial systole before the atrioventricular valves close. The delay allows atria to contract and empty blood into ventricles before the ventricles contract. It this didn’t happen the ventricles would contract at the same time pushing blood back into atrium and a small volume of blood being moved into ventricles. D.4 U 5 ​Conducting fibres ensure coordinated contraction of the entire ventricle wall. Describe the motion of the signal to contract from the AV node through the ventricles. List features of Purkinje fibers that facilitate rapid conduction of the contraction signal through the ventricle. State that the contraction of the ventricle begins at the heart apex. Once through the AV node and bundle, the signal is conducted rapidly to ensure the coordinated contraction of the ventricles. The signal moves down fibers that split into the right and left bundle branches and these branches conduct the impulse through the walls of the two ventricles. At the base or apex of the hear the bundles connect to Purkinje fibers which conduce the signal even more rapidly to the ventricles. The Purkinje fibers have modifications that help conduct at high speeds: have fewer myofibrils, bigger diameter, more voltage-gated sodium channels, and lots of mitochondria. Contraction of ventricles begins at the apex of heart. D.4 U 6 ​Normal heart sounds are caused by the atrioventricular valves and semilunar valves closing causing changes in blood flow. D.4 A 1 Use of artificial pacemakers to regulate the heart rate. Pacemakers are medical devices that are surgically fitted in patients with malfunctioning sinoatrial node. The devices maintains the rhythmic nature of the heartbeat. They can provide a regular impulse or discharge only when heartbeat is missed so that it beats normally. Most common is the one that monitors heartbeat and initiates one if a beat is missed. The ventricle is stimulated with a low voltage pulse. D.4 A 2 ​Use of defibrillation to treat life-threatening cardiac conditions. State the cause and effect of ventricular fibrillation. State the purpose of a defibrillator. Cardiac arrest occurs when blood supply to hear is reduced and heart tissues are deprived of oxygen. First negative consequences of abnormalities in cardiac cycles is ventricular fibrillation or twitching of ventricles due to rapid and chaotic contractions. Defibrillation is a technique used in emergency medicine to terminate ventricular fibrillation or pulseless ventricular tachycardia. It uses an electrical shock to reset the electrical state of the heart so that it may beat to a rhythm controlled by its own natural pacemaker cells. It is not effective for asystole (complete cessation of cardiac activity, more commonly known as "flatline") and pulseless electrical activity (PEA). The purpose of defibrillation of ventricular arrhythmias is to apply a controlled electrical shock to the heart, which leads to depolarization of the entire electrical conduction system of the heart. When the heart repolarizes, the normal electrical conduction may assert itself, in which case the ventricular arrhythmia is terminated. However, if not enough energy is used for defibrillation, the heart may not be completely depolarized, in which case the ventricular tachycardia or fibrillation may not be terminated. Also, if the heart itself is not getting enough oxygen or if there is an instability of the electrolytes in the cardiac cells, the ventricular arrhythmia may recur. D.4 U 3 ​Causes and consequences of hypertension and thrombosis. Describe the relationship between atherosclerosis and thrombosis. Describe the relationship between atherosclerosis and hypertension. Outline factors that are correlated with a greater incidence of thrombosis and hypertension. Hardening of arteries caused by formation of plaques on inner lining of arteries. Plaques are swollen areas and accumulate debris. Develops because of high circulating levels of lipids and cholesterol reducing the speed of which blood moves through vessels. Triggers a clot, or thrombosis, which can block blood flow in that artery and deny the tissue access to oxygen. Greater pressure on walls of arteries caused by slowed blood flow. Constant high blood pressure can weaken artery causing wall to enlarge and form bulge (aneurysm) that can bust and cause internal bleeding, chronic high blood pressure that can lead to stroke by weakening blood vessels in brain, chronic high blood pressure causes kidney failure. D.4.S 1 ​Measurement and interpretation of the heart rate under different conditions. List variables that can influence heart rate. Outline methods for detecting heart rate. Different variables can influence heart rate. Exercise, intensity of exercise, recovery from exercise, relaxation, body position including lying down, breathing, and breath holding, exposure to a cold stimulus, and facial immersion in water all affect heart rate. D.4 S 2 ​Interpretation of systolic and diastolic blood pressure measurements. State the cause of systolic and diastolic pressure. Blood pressure or arterial pressure is the pressure that circulating blood puts on the walls of the arteries. Peak pressure occurs during ventricle systole to a minimum near beginning of the cardiac cycle when ventricles are filled with blood and are in systole. D.4 S 3 ​Mapping of the cardiac cycle to a normal ECG trace. State the function of an electrocardiogram. 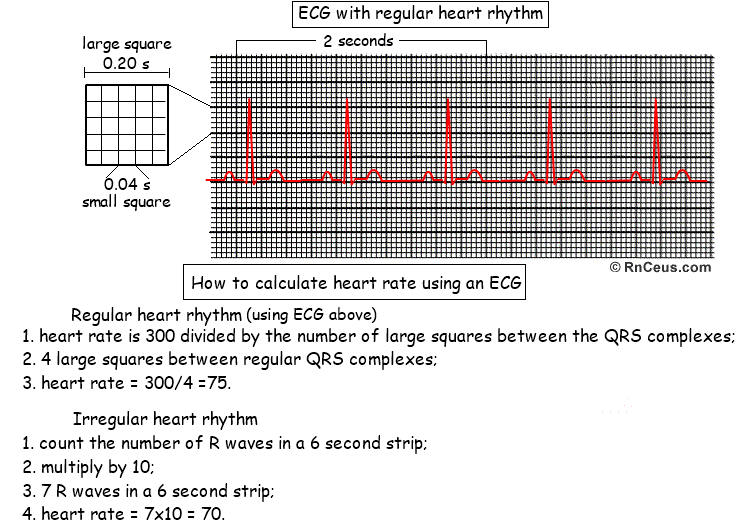 Label the P, Q, R, S and T waves on an ECG trace. State the cause of the P wave, the QRS wave and the T wave. D.4 S 4 ​Analysis of epidemiological data relating to the incidence of coronary heart disease. 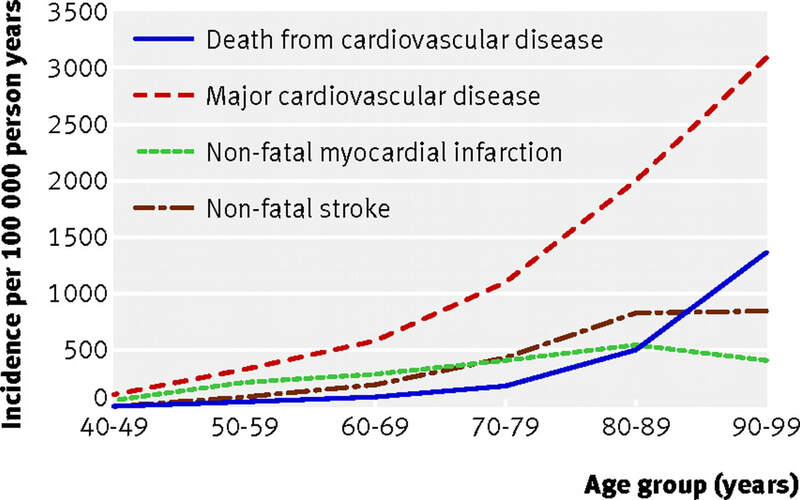 List epidemiological factors that can predispose ethnic groups to coronary heart disease. Coronary heart disease refers to the damage to the heart as a consequence of reduced blood supply to the tissues of the heart itself. Often caused by narrowing and hardening of the coronary artery. Epidemiology is the study of the patterns, causes and effects of diseases in groups of individuals or populations. Ethic groups can differ in their disposition of CHD because of differing diets and lifestyles. Gender groups, age groups, groups that differ in level of physical activity can also differ. 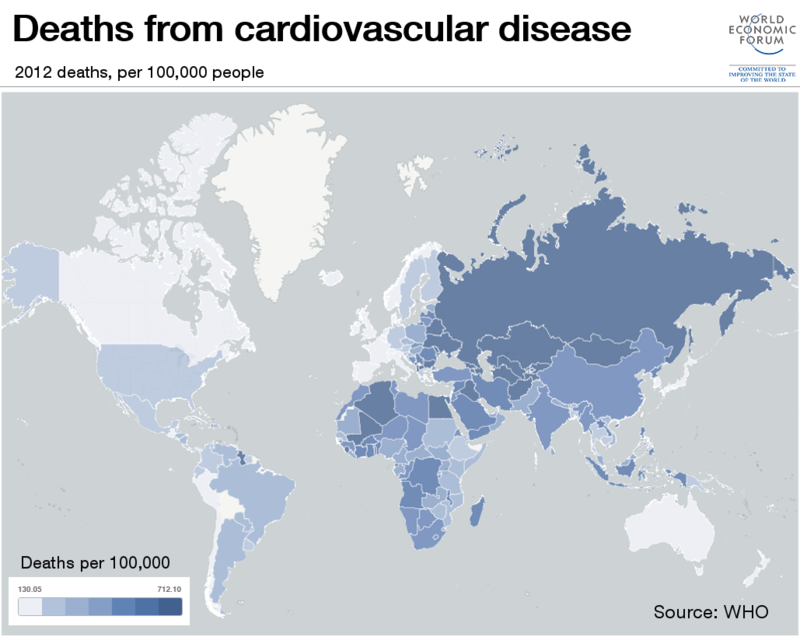 ​Greater difference in CHD mortality in elderly between countries in males and females. ​Symbols are used as a form of non-verbal communication. Why is the heart used as a symbol for love? What is the importance of symbols in different areas of knowledge? ​In this medical animation we take a look at the heart and how it pushes oxygenated blood out to the body then returns to be re-oxygenated by the lungs and pushed out again. Phases of the cardiac cycle. What is electrocardiography (ECG/EKG). ECG is a way to measure the electrical activity of the heart. 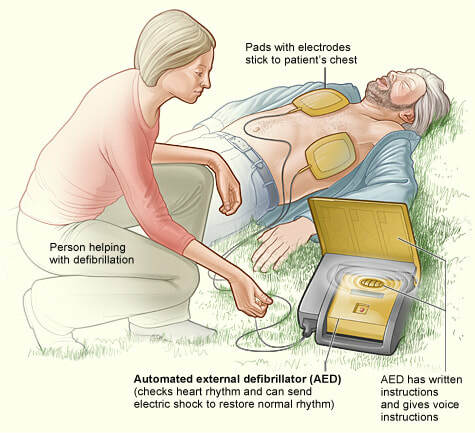 ​AED's, or Automatic External Defibrillators increase the chance of survival of a heart attack victim by 90%. This educative cartoon shows what any patient or family member should understand about cardiovascular disease, when confronted with a diagnosis of carotid artery stenosis, abdominal aneurysm or claudication.